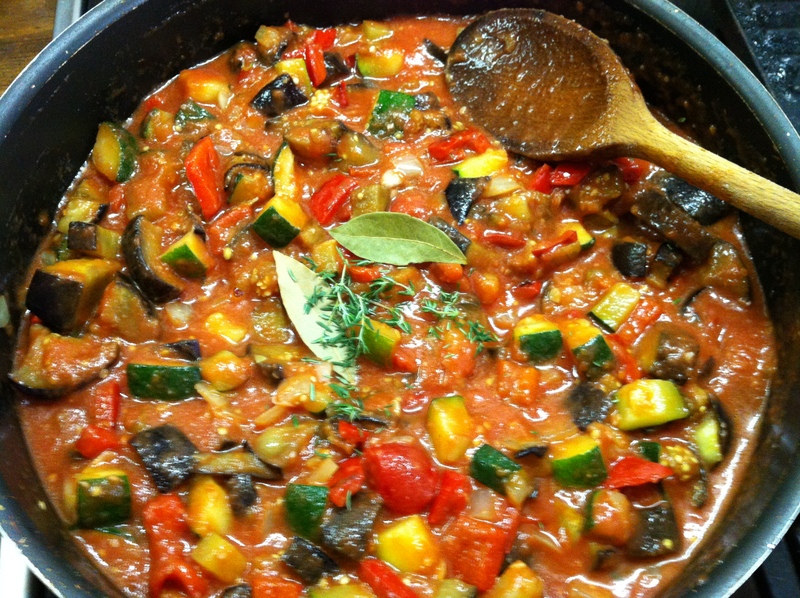 This recipe is the best recipe I am yet to find for ratatouille and I highly recommend making a large quantity and having some in the freezer for a delicious paleo side dish. Like curry’s and casserole’s, this dish improves the longer you leave it in the pan, though I would be hesitant to leave it longer than a day or two without refrigeration. The recipe comes from Claudia Roden’s book Mediterranean Cookery and is entitled Henri Fontin’s Ratatouille; this recipe is Henri Fontin’s and all credit goes to him as this is his recipe all I have done is alter the quantity of vegetables used and added a little bit of extra preparation. I think this is the longest recipe (in terms of Preparation to Plate) time I have posted yet but it is well worth the wait, the time can be shorted if absolutely necessary however, see recipe or details. The quantity can be increased or decreased depending on the amount you want to make, as I recommend I’d say larger batches are better. Shift workers are especially advised to do this and then freeze it in individual portions ready to be defrosted and heated up before shift. This recipe does come with a warning however as it is deliciously addictive and may be consumed in large quantities in one sitting. 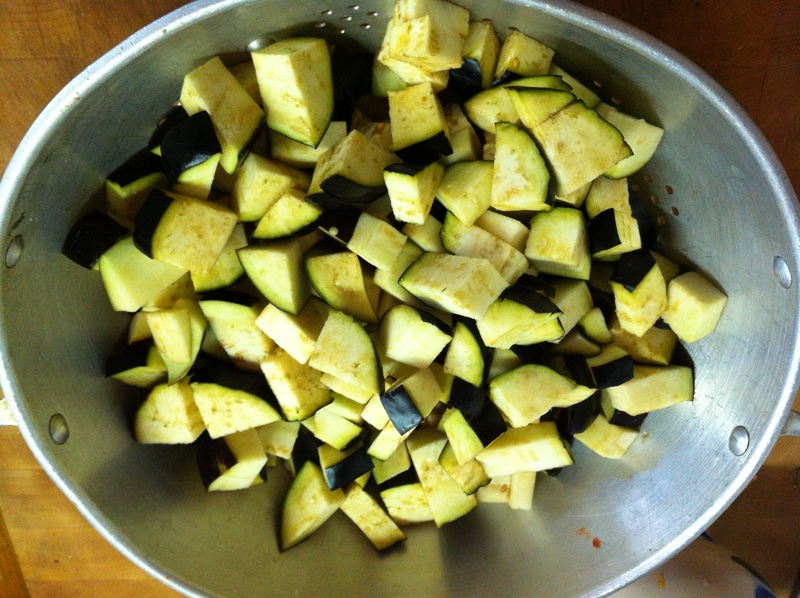 Start by chopping the aubergine into 1-2 cm pieces and place them in a colander with a plate or bowel underneath them. 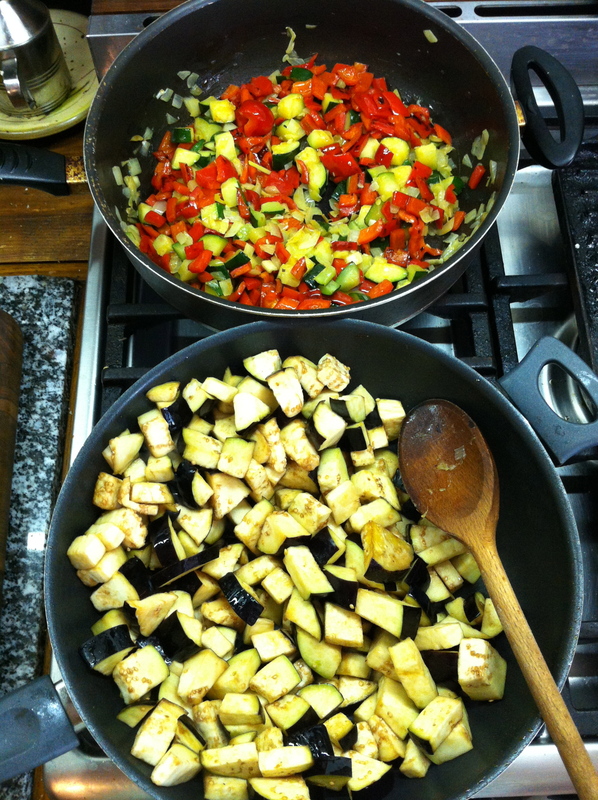 Salt the aubergine pieces well and leave in the colander while you prepare the rest of the vegetables. 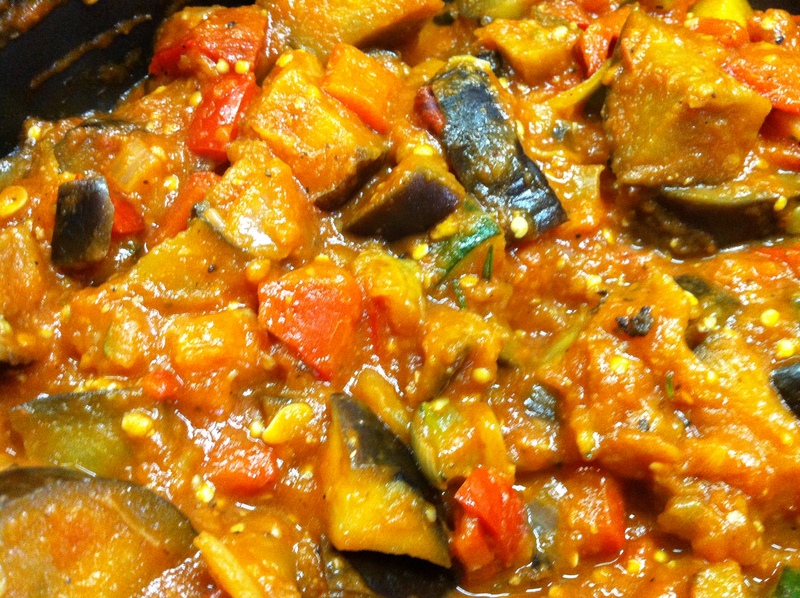 This step is not essential but it adds a lot of flavour and helps with frying the aubergine. 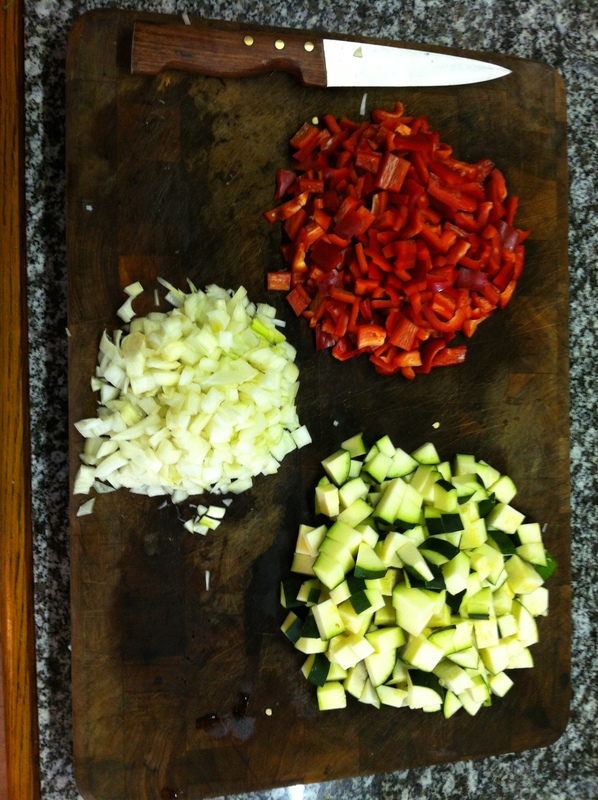 Chop the red peppers and courgette into 1-2 cm pieces and finely chop the onions. The size of the pieces can be entirely down to your personal taste, I chopped mine a little finely compared to what I recommend in this recipe but do it as you like it, after all, you’ll be eating it. In a large, deep frying pan add some olive oil and fry each of the vegetables separately (onions, courgette, peppers and aubergine) in which ever order you wish, what I’ve put in brackets is how I fried them. For all the vegetables, except the onions you want to fry them until the vegetables are al dente and turing brown around the edges. 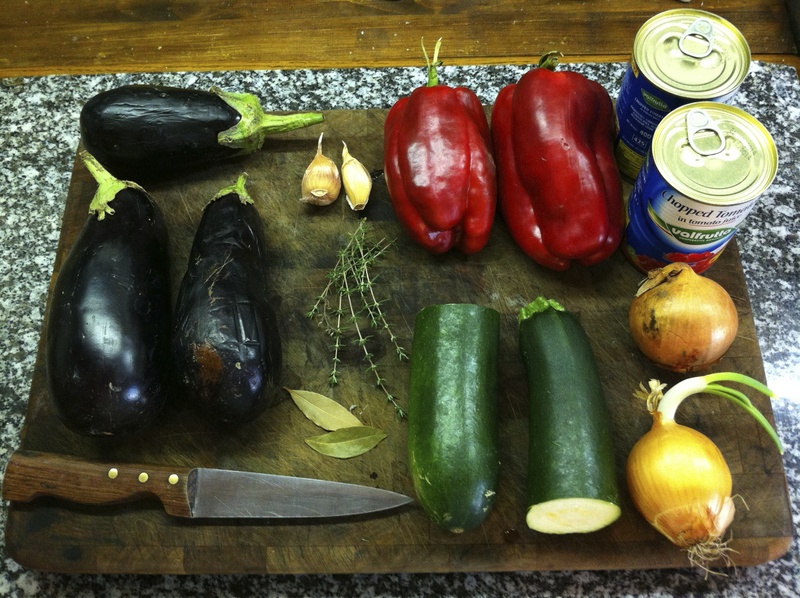 The aubergines will need slightly longer than the others. Once each of the vegetables is cooked add them to a separate deep saucepan while you cook the next batch. Once all the vegetables have been fried, use a hand blender to blitz the tinned tomatoes into a smooth consistency before adding to the vegetables. Add the garlic and all the herbs to the pan. Add salt and pepper to taste and cover and cook over a medium heat for at least 15 minutes. The more time you cook them for the better it will taste. I cooked it for about an hour over a low heat, stirring ever minute or so; this shouldn’t be left unattended as you don’t want the tomatoes to burn. Once cooked, taste again and re-season if necessary. If you are going to freeze this in batches, which again I would highly recommend, then let the ratatouille cool down fully before putting into containers or bags and freeze. If you are going to be doing a run of shifts then I would recommend keeping some in a bowel, covered, in the fridge to quickly add in the morning/evening for your shifts. Hi, am glad you are enjoying the blog, there will be new updates soon I know I have been absent for quite a while now. In answer to your question there is a Widget for that, I use it on my blog. If you go into the Appearance settings (when you make adjustments to your blog), scroll down to Widgets and then scroll down to the very bottom and you’ll see ‘Twitter’ as an option. I believe this will do what you want.